Shadows moved. A fox squirrel crept in the midst of downed branches beneath a large red oak. Grape vines spiraled up that tree, weaving back and forth over each other. The tip of a bushy tail twitched and flicked as it searched behind the largest limb and wandered away from the oak’s trunk. The fox squirrel bounded into the open and stopped near a modest-sized sassafras tree that curved to the north. It paused, stared at the ground, picked up an acorn, clenched the prize between its front paws and turned it as it nibbled. The squirrel dropped the nut and began pawing at the earth with frantic abandon. Leaves and dirt flew. This forest tenant sat upright with a start, then bounded south with relaxed hops. A number of posts on this site deal with accommodating modern hunting regulations. Most often these missives cite “measured compromise” as the appropriate mental tool needed to minimize the intrusion of ethical game-management rules. In essence, the principle of measured compromise assesses the importance of a given intrusion, weighs the gravity of a circumstance’s impact on the traditional black powder hunting scenario as a whole and applies a suitable solution that minimizes that impact. There is little doubt that taking account of the given state’s game rules change, or perhaps said better, modify the period-correct complexion of any simple pursuit. That late September afternoon, in the Year of our Lord, 1796, the trading post hunter sat in the forest taking note of the game at hand. 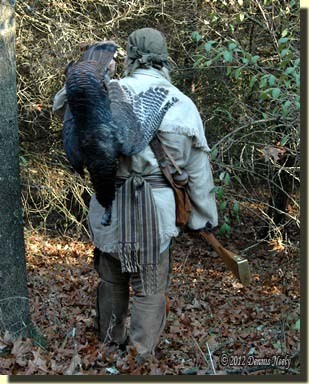 Death bees awaited release in the breech of “Old Turkey Feathers.” The clothing chosen for that wild turkey hunt did not include any hunter orange outer garments; none were required in the game rules. However, as is usually the case, a hunter orange silk scarf, rumpled up and tucked away inside the linen hunting shirt, was available. By choice, the post hunter could have donned the scarf in compliance with Michigan’s rules for hunting small game and legally shot the first fox squirrel. But such an action was not consistent with the scenario for that particular traditional hunt. 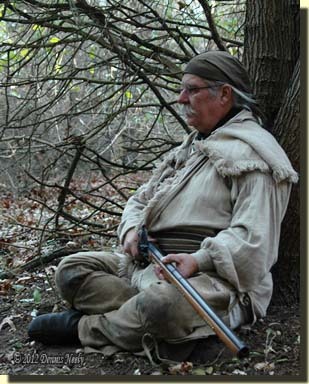 Of late, my research has jumped from source to source as I move forward with differentiating each of the three characters that I portray: the trading post hunter, Msko-waagosh, the returned white captive from 1794, and Mi-ki-naak, also a returned captive but from 1763. Not long ago, I spent an evening or two reviewing John Sayer’s Snake River Journal, 1804 – 05: A Fur Trade Diary from East Central Minnesota. The purpose of that reading was to look further into the details of Sayer’s hired hunter, “Outarde,” translated as “goose” by the journal’s editor, Douglas A. Birk. (Birk, 38) I should note that I do not find this translation in any of my Ojibwe to English guides, but the possibility exists the name comes from a band other than the Anishinabe people. Over the weeks and months that follow, Outarde and the other hunters supply a variety of meat to Sayer for the trading post. Sayer’s journal does not always mention payment in return, but most often he notes Rum or High Wines. He does mention supplying “ammunition” a couple of times, which with that quantity of game would be of great concern and no small expense. In 1794, a prime beaver pelt bought two handfuls of gunpowder, or a handful of shot or 30 round balls ( three prime beaver pelts for gunpowder, shot and round ball). After the snow arrives, Sayers mentions “the Hunter’s camp” and says that either Outarde requested men be sent to his camp to fetch meat or Sayers took it upon himself to send the men to bring back meat. At any rate, the accumulation of snow seems to be the point at which Outarde remains at a hunting camp. By taking these journal entries in context and following them day to day, a traditional hunter can put together a reasonable idea of a post hunter’s existence, including the volume of game taken and the effort needed to fulfill a hired post hunter’s commitment. Often living historians rely on one journal entry to justify either an accoutrement or a practice. Sometimes that choice is safe and at other times it is not. We all do it, but I believe in recent years this cherry picking of passages has become more prevalent. I question if we, as seekers of a past lifestyle, aren’t fooling ourselves when it comes to authenticity. Of late, I have taken a few steps back while trying to move forward. The foundation of any traditional hunt is solid documentation, followed by careful emulation of what the old journals say, or don’t say. Regardless of historical occupation, hunter and non-hunter alike, an 18th-century time traveler must review the journals and narratives as a whole, paying closer attention to the sum of the activities listed in the guiding words of our heroes of yesteryear.